Don’t let the title fool you, the Strawberry Fields Triathlon is one of the best run events I’ve had the honor of participating in in my triathlon career. Race maps were accurate, volunteers were extremely helpful, transition area was marked with reserved spaces, and the pre-race information was highly detailed and accurate. The next race to reach the top of my charts has a lot of work ahead to top this race! 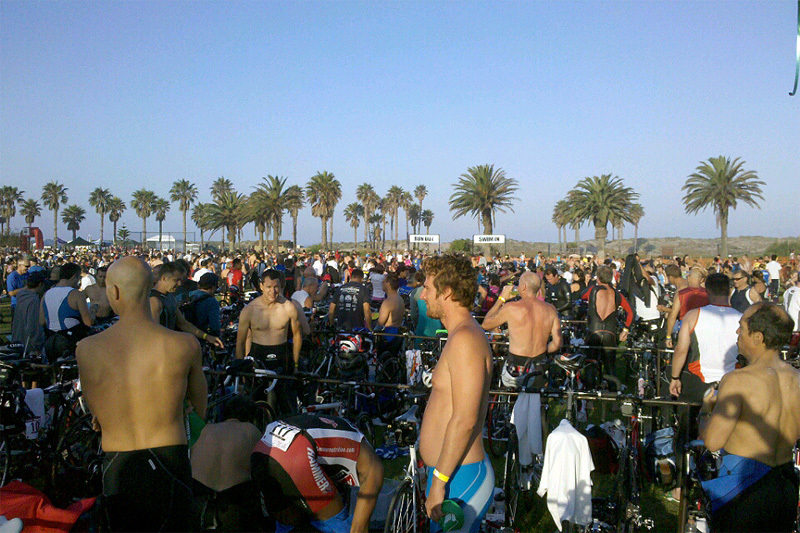 The swim portion of the triathlon consisted of a 450m ocean swim just off Oxnard State Park. The thing that made me nervous after visiting the site the day before was the long, sandy beach run from the water’s edge to the transition area. Plotted in Google Earth at 0.26 miles, this was going to separate the men from the boys. Beach running and I just don’t get along, in fact it kills my legs and saps them of energy. However, the morning of the triathlon, another hell quickly materialized. After setting up my transition area and heading down to the beach, the calm conditions were not exactly calm. High surf, crashing waves, and swell at over four feet was just the icing on cake. In fact getting out to the first buoy was just the first step into hell. Turning right at the first buoy sent the swimmers parallel to shore, but meant we had to swim diagonally across breaking surf, huge waves, etc to the second buoy. Then it was simply keeping your head above water and riding the waves to shore. Entering the water is all about timing. Being part of the first wave, I didn’t have the ability to watch others enter the water, but I did have enough to observe the wave patterns. One large wave, two smaller ones and then calm before the pattern repeated. I used this to my advantage, letting the “pros” run out into the first “big” wave only to get themselves clobbered! I more patiently waded out into the surf, waited for the two smaller waves to break and then started side stroking for my life. It worked, but the four foot swell was too much. I dogie paddled around the first buoy and thought to myself how crazy it was that I was actually doing this. Just shy of half way that realistic voice told me to quit, then the competitive voice said that that would embarrassing. Then the lifeguard actually looked me in the eye and asked “are you done?” “HELL NO!” The evil voice in me suggested knocking him off his surfboard throne into the hellish cold I was suffering in, but then I would get disqualified, not totally embarrassing, but not exactly the nice thing to do. Approaching the second buoy conditions continued to change as we swam diagonally across the surf/waves. The waves were pushing us toward shore and the lifeguards were desperately trying to push the buoy back out into position. This gave us a narrow space in which to turn. By this time, the speed-demons of the second wave caught up to us and I found myself in a mixed hell of human arms and feet, cold water, breaking, waves, lifeguards, and possibly even a few sharks (not really!)! The cool thing was riding the wave to shore. While everyone stood up and started running in the water, I managed to catch a giant wave and went surfing by the runners! Woohoo! Then it was time to run up the beach. This sand was like no sand I’ve walked on before. Extra dry, extra course, extra deep, and extra loose. With every step I could feel my legs strain, energy disappearing and my heart rate racing. The British competitor that caught up to me just when we hit pavement said it best, “Could they have put the transition area any closer to China? We aren’t running marathons… we are triathletes!” I will never forget that! I will also never forget that on July 18th, just after 7:30am, I entered a hell that I never expected to see and lived to talk about it. T1 – I Am Alive! Transitions are where triathletes can really shine, proving their ability to quickly switch between sports. On this day, I was just so happy to be alive after swimming through hell, that I wanted to relish in the fact I was still standing. Strip off the wetsuit, grab the shorts, turn on the GPS, put on the HR monitor, socks, jersey, grab some water, put on the shoes and helmet and enjoy the fact that I am still standing. With the bike off the rack, time to run another marathon to the bike mount. T1 was a shamefully leisurely 4:15! Ouch! Cycling is my thing. I love cruising on the bike, enjoying the scenery, enjoying the smells (pleasant and otherwise! ), and feeling the air rush by. Mounting on the bike, I felt like I went to heaven. 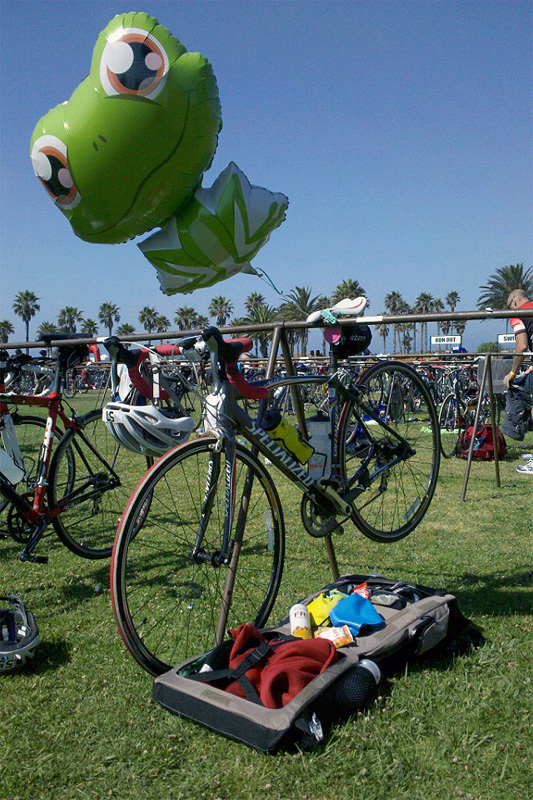 The course was very similar to the Ventura Triathlon course, although there was a surprise in the end for me. The course went north along Harbor Blvd, west across Gonzales Rd to Victoria, an out and back segment along 5th ave, and then swing back to Oxnard State Park via Channel Islands Blvd. The course races amongst natural land, the agricultural fields growing produce such as strawberries, and then through the civilized world of Oxnard. Such a great course that is quite flat and lets one just cruise. However, it wasn’t all flat. Toward the end of the 11.5 mile route, one must go up and over the Channel Islands Harbor, an extreme incline compare to the rest of the route. Heaven on the muscles. Rounding the corner back into the park, there was a slight communication problem as to when one should dismount. The first volunteer said to dismount after the line, the second said to dismount before the line. I split the difference… stopped with the line mid-bike. T2 – Forgot Something… Again! You have something go so well that you know you must have missed a step. Yep, my T2 was so good, I totally forgot something. After mounting the bike, removing the helmet, changing shirts, shoes, etc, I started off toward then Run Start. Its that moment where you are going through a mental checklist and you suddenly realize that something is missing? That sinking feeling? Yep, I had that feeling when I realized that I forgot to put on my number belt. Not the end of the world, but required. I ran back across the transition area to get it. Ugh! total T2 time was a doubly shameful 3:38! Run – Let’s have some fun! With everything finally in order, I started to run. I’ve had to go to the the bathroom since I started this event. Since the run course went right by the bathroom, I figured I had very little to loose and a lot to gain by making a brief pit-stop. It took about 60 seconds and I was back running. I’ve been working with a running coach who has really helped my run become more efficient. By leaning through the hips and using my legs to carry momentum forward using gravity, I can run slightly faster than before at a lower heart rate. Using this new technique, I settled in and just enjoyed the final leg of this fantastic event. While I did stop for a few brief moments, I can’t believe how well I kept up a decent pace. The straight shot run along Ocean Dr. reminded me more of Tijuana than California. The narrow road with tall multi-story residences and sand covered intersections put me another country, adding to the fun. Rounding the last few curvy turns toward the finish I really quite surprised at how good I felt. The final sprint came fast and seeing the time clock really sent the reality of finishing the event home. With a potty break and steady pace, the 5k run came in at 36:40. Finishing this event in 1:33:51 puts me in 384th place overall and second to last (of 35) in my age group. (note: official results are posted here) After finishing a triathlon, I expect to walk away from the experience having learned a few things. To do otherwise, one would not be fully experiencing the event nor would they call themselves a triathlete. What I thought constituted a rough ocean paled in comparison to the conditions of the event. I survived and know what hell looks like. Transition times are important and need to be improved greatly! With an average transition time of 3:56, shaving even one minute off each time would have bumped me up to 367th place from 384th overall and up one position in my age group. My modified running form is working. Being more efficient on my feet during the run feels great and I really am looking forward to making more progress. The 2010 Strawberry Fields Triathlon was run so well, that this event sets the standard for how to run an event. Pre-race positive visualization works well. It doesn’t help to get stressed out over what could be during an event. Simply taking the event in stride and going with each blow as they come is the only way to succeed. There might be some more, so I will add to this list as I continue to reflect on this memorable event. What’s next? I am not quite ready to go there yet. I am still riding my high from this event. I know what I need to do succeed and I am more determined than ever to push on and make the next event the best yet! This entry was posted in analysis, Commentary, Competitions, Cycling, Goals, inspiration, milestones, Results, Running, Swimming, Triathlon and tagged Commentary, Competitions, Cycling, Running, Strawberry Fields Triathlon, Swimming, Triathlon. Bookmark the permalink. Congrats on the race we love that transition set up photo with the GYST bag !